We believe in being passionate about what you do. If you value community, service and innovation — and if technology sets you on fire, A2U might be a good fit for you. 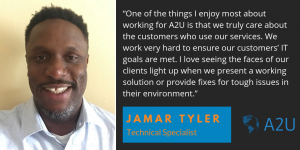 Do you want to get to know some of our employees or get a glimpse inside working at A2U? Then, read this blog post. Our team is made up of savvy tech gurus, industry experts and a few sales and marketing folks — all bringing years of experience to our company. Our unique experiences and proven track record enable us to solve even the most complex, IT challenges for organizations across the country. The role of the support analyst is to provide front-line primary (phone and email) technical support to end users on various technical issues and problems. This position is responsible for responding to, documenting and resolving support tickets in a timely manner according to defined SLA and OLA. In this role, the support analyst will perform root cause analysis, develop checklists for typical problems and recommend procedures/controls. The account executive is responsible for building relationships in person and selling professional services and technology solutions to customers. This role works within an assigned territory in the field for a particular business segment. This person will build customer loyalty, achieve sales goals and master solution selling. The networking specialist is responsible for supporting the maintenance of clients’ local and wide area networks, software, third-party data processing systems and management information systems. Essential responsibilities of this position include: promoting a secure environment; document and maintain changes in environment to support compliance and reporting; install hardware and software as needed; maintain vulnerability scanning and diagnose/resolve end user issues. This position provides consulting services for customers and requires a highly motivated and experienced candidate to work closely with project managers and infrastructure engineers to support, implement and design solutions. This position will focus on the implementation of virtualization technologies and related infrastructure such as Citrix XenDesktop, VMware ESX, Microsoft Exchange, storage and networking. Duties and responsibilities; including but not limited to: Mitigate difficult customer situations through conflict resolution strategies, identify opportunities to reduce waste and increase efficiency, write clear and concise reports and provide exceptional customer service. Interested in learning more about joining our awesome team? Or, don’t see an open position here that is a clear match with your background? 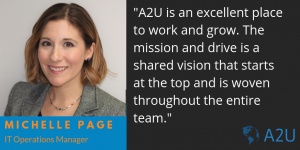 Talk to us at careers@a2u.net – our team is growing. And, we’re always on the lookout for great additions.